Autophagy, meaning self-eating, is an intracellular degradation system wherein unwanted cargo, such as old or damaged organelles, unneeded proteins, as well as pathogenic agents, are digested and the macromolecular contents from the digestion are released back into the cytosol . First described in 1963 by Christian de Duve , autophagy involves the sequestration of cell organelles and cytoplasmic material into double-membrane vesicles called autophagosomes and their subsequent delivery to the lysosomes for degradation by the lysosomal hydrolases . Autophagy in eukaryotes comprises of three different pathways, namely macroautophagy, microautophagy and chaperone-mediated autophagy. Although all of the three mechanistically different pathways culminate in the lysosomal degradation of cellular cargo, macroautophagy is the most extensively studied and is discussed here briefly . The mechanism of macroautophagy is conserved among eukaryotes and is characterized by the encapsulation of cellular cargo into double-membrane vesicles called autophagosomes. In yeast, the formation of autophagosomes around the targeted cargo is mediated by autophagy-related (Atg) proteins that are recruited hierarchically to the phagophore assembly site or the preautophagosomal structure (PAS). At the PAS, initiator protein complexes facilitate the de novo synthesis of a double membrane structure called a phagophore or an isolation membrane, the lipid components for which are derived from the golgi-endosome system . In mammals, where a distinct PAS-like structure has not been identified, multiple cellular organelles, including the plasma membrane, are known to serve as origins for the assembly of a phagophore . Upon the recruitment of other Atg proteins, the isolation membrane gets extended into a phagophore, which eventually fuses at its free ends to form an autophagosome, which now surrounds and sequesters the cargo. Once formed, autophagosomes undergo a maturation process as they are transported along the endocytic pathway, before fusing with the lysosomes to form autophagolysosomes. The cellular cargo delivered by the autophagosomes are then degraded by the hydrolytic enzymes of the lysosomes and the products of degradation are released back into the cytoplasm for cell use . The other two autophagy pathways do not require the formation of an autophagosome. 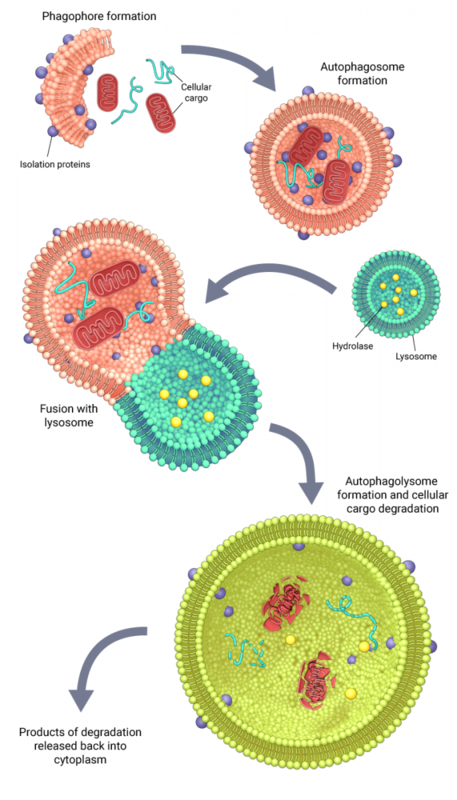 In microautophagy, the lysosome directly engulfs portions of the cytoplasm , whereas in chaperone-mediated autophagy, specific chaperone proteins bind to the cargo and transport it across the lysosomal membrane for degradation . Autophagy is a both a stress-management system and a means of homeostatic control in cells, and is therefore regulated differently under varying cellular conditions. 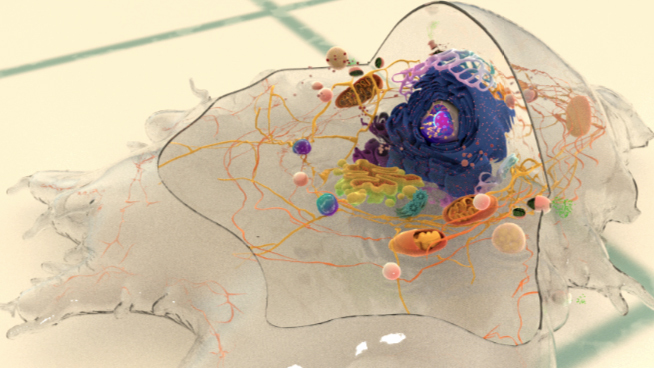 For instance, in cells functioning normally under stress-free conditions, a basal level of autophagy ensures that old, damaged organelles and proteins are rapidly digested and that the contents from digestion are recycled back into the cytosol, so that the availability of cellular components are regulated for various cellular functions. But, in response to various types of cellular stresses such as nutrient starvation, oxidative stress, radiation or anticancer therapy, the autophagic machinery is upregulated in order to rapidly detoxify cells as well as to increase the recycling of cellular components to keep up with intensified cell function . Furthermore, in normal physiology as well as under pathological conditions, autophagy is known to play a direct role in inhibiting apoptosis by regulating interactions between autophagy protein Beclin-1 and apoptosis regulator Bcl-2 . However, in the absence of stringent spatio-temporal regulation, excessive autophagy can function as an alternative cell-death pathway . Therefore, dysregulated autophagy has been associated with the onset and progression of diseases such as cancer, neurodegenerative and autoimmune disorders, and many more . When autophagy is acting as a pro-survival mechanism primarily induced by stress, it can be naturally regulated by mechanical stresses such as compression, stretching or shear stress due to fluid flow. Consistent with this, a number of studies have highlighted how cells respond to mechanical stresses by regulating autophagy levels and how this could have implications in both physiological as well as pathophysiological conditions. For instance, in response to a mechanical stimulus such as exercise, the mineralization capacity of mechano-sensitive osteoblasts is stimulated, leading to enhanced bone formation and remodeling. In relation to this, recent studies on UMR-106 rat osteoblast cell line have shown an increase in autophagy during mineralization and suggested a link between low bone density and deficiency of the autophagy protein Atg5 . Such studies are indicative of the role of autophagy in regulating bone remodeling in response to mechanical stimuli. Another recent study has demonstrated that cells induce autophagy in response to compressive stresses. Following application of compressive forces of up to 1kPa, which is within the range of normal physiological forces experienced by cells, there was a transient increase in the rate of autophagosome formation . This transient increase was suggested to function as a cellular stress management system until the cell is able to adapt to physical changes in their environment. On the other hand, excessive mechanical stresses can have an opposite effect, leading to suppression of autophagy. In a recent study by Carames et al, human and mouse cartilage explants subjected to high impact mechanical injuries underwent cell death, which was associated with a significant decrease in expression of autophagy markers. Interestingly, pharmacological stimulation of autophagy by rapamycin protected against cell death, highlighting the interaction between autophagy and mechanical stress in maintaining healthy cells . What is Fast Endophilin-Mediated Endocytosis? FEME is a novel clathrin-independent endocytic pathway, regulated by the BAR domain protein endophilin, where tubulo-vesicular carriers form within seconds at the plasma membrane upon activation of specific G-protein coupled receptors (GPCRs) by their ligands, internalizing GPCRs and moving rapidly towards the perinucleolar area. Read more..
How does exocytosis affect cell mechanics? The recycling and delivery of membrane by exocytosis can be used by the cell to enlarge the membrane and surface area during cell shape changes.The interaction between membrane tension, unfolding and trafficking has been demonstrated by a number of studies. Read more..
Exocytosis is defined as the transport and fusion of secretory vesicles with the plasma membrane and the extracellular space. There are three exocytosis pathways that deliver vesicles to the plasma membrane. Read more..
How do clathrin-coated vesicles invaginate and mature? Clathrin-coated vesicle maturation incorporates the activities of a range of proteins. Actin, myosin and WASP all have important roles in the formation and stabilization of clathrin-coated pits (CCPs). Read more..
What causes the narrowing of clathrin-coated vesicle necks? In the final stages of clathrin-coated vesicle (CCV) formation, Phosphatidylinositol-4,5-bisphosphate (PIP2) undergoes a dephosphorylation by phosphatases such as synaptojanin 1 (Synj1). This promotes further membrane curvature at the vesicle bud, dissociation of the BAR domain proteins (BDPs) and closing of the membrane bud neck. Read more..
How do clathrin-coated pits form? Adaptor proteins such as AP-2, AP180 and CALM (Clathrin-assembly lymphoid myeloid leukaemia protein), which accumulate within the lipid bilayer, are responsible for the recruitment of the triskelion shaped Clathrin trimer. This trimer does not interact with the membrane directly but instead forms a reinforcing lattice structure that acts as a mold in which membrane vesicles may develop. Read more..
How does dynamin help in the scission of clathrin-coated vesicles? In mammalian CME the GTPase dynamin is believed to play important roles in invagination and clathrin-coated pit (CCP) maturation. Its binding partners endophilin and amphiphysin, can also induce tubulation of the vesicles and have been shown to copolymerize with dynamin. Read more..
How are clathrin-coated vesicles uncoated? Uncoating is the process by which clathrin is removed from clathrin-coated vesicles (CCVs). In mammals, this ATP dependent process is driven by the 70kDa molecular chaperone ‘Heat shock cognate protein’. Read more..
How are clathrin-coated vesicles targeted to endosomes for fusion? Different cytoskeletal networks have been implicated in the transport of clathrin-coated vesicles (CCVs). In yeast, the actin cytoskeleton traffics dissociated CCVs, whilst in mammals the microtubule network transports is involved in the sorting of CCVs to distinct populations of early endosomes. Read more..
Clathrin-mediated endocytosis (CME) is a vesicular transport event that facilitates the internalization and recycling of receptors engaged in a variety of processes, including signal transduction (G-protein and tyrosine kinase receptors), nutrient uptake and synaptic vesicle reformation. Two classical examples of CME are iron-bound transferrin recycling and the uptake of low-density lipoprotein (LDL). Read more..
How is caveolar endocytosis mechanically regulated? The cell cytoskeleton plays a role in caveolar organization and trafficking. Actin stress fibers influence the linear distribution of caveolae at the plasma membrane in many cell types. Read more..
Caveolar endocytosis is a clathrin-independent endocytic process which involves bulb-shaped, 50-60nm plasma membrane invaginations called caveolae (or ‘little caves’). Caveolae formation is driven by integral membrane proteins called caveolins as well as peripheral membrane proteins called cavins. Read more..
How do mechanical stresses regulate autophagy? When autophagy is acting as a pro-survival mechanism primarily induced by stress, it can be naturally regulated by mechanical stresses such as compression, stretching or shear stress due to fluid flow. Consistent with this, a number of studies have highlighted how cells respond to mechanical stresses by regulating autophagy levels and how this could have implications in both physiological as well as pathophysiological conditions. Read more..
What is the physiological relevance of autophagy? Autophagy is a both a stress-management system and a means of homeostatic control in cells, and is therefore regulated differently under varying cellular conditions. Read more..
Autophagy, meaning self-eating, is an intracellular degradation system wherein unwanted cargo, such as old or damaged organelles, unneeded proteins, as well as pathogenic agents, are digested and the macromolecular contents from the digestion are released back into the cytosol. Read more..
Arf6-associated endocytosis is a clathrin-independent, plasma membrane-endosomal recycling pathway, regulated by the Arf6 protein, which is a member of the Arf family of small GTPases. In this pathway, Arf6 cycles between the inactive GDP-bound state and active GTP-bound state. Read more..
How is membrane trafficking mediated by transport vesicles? Both endocytosis and exocytosis utilize small compartments of membrane to enclose their cargo. These transport vesicles bud off from one membrane and can dynamically fuse with other membranes, or split up into smaller vesicles by fission. Residing within the interior, or lumen, of the transport vesicles, the cargo is protected from the cytoplasm. Read more..
Membrane trafficking encompasses the wide variety of processes that go into the movement of cargo (typically proteins, pathogens and other macromolecules) using membrane bound transport vesicles. This transport can take place within different organelles in the same cell, or across the cell membrane to and from the extracellular environment. Read more..
How is membrane curvature generated? Several mechanisms have been proposed to be responsible for the generation of membrane curvature. One of the mechanisms is attributed to the specific shape of the lipid group that makes up the membrane and to any changes in their distribution or symmetry. Read more..
Membrane curvature refers to the physical bending of membranes to accommodate various cell morphology changes as well as the formation of membrane-bound transport intermediates like spherical vesicles or tubules. Read more..
How do membrane reservoirs alter membrane tension during cell spreading? Membrane area is very closely linked to membrane tension, cytoskeletal attachment and membrane reservoirs. During cell spreading, the initial increase in membrane area requirements are met by depleting membrane reservoirs with the morphology of large folds such as microvilli, spikes, filopodia and ruffles. Once these reservoirs are depleted, membrane tension increases and activates exocytosis as well as myosin contraction. Read more..
How do components in a lipid bilayer move? One of the tenets of the Fluid-Mosaic membrane model is that the components of the bilayers are free to move. Using a phospholipid as an example, the first type of movement is rotational. Here the phospholipid rotates on its axis to interact with its immediate neighbours. Read more..
What is the role of membranes in mediating vesicular transport? Another major biological role of cell membranes is in mediating vesicular transport, either during the secretory pathway when proteins are transported from the endoplasmic reticulum to target locations such as lysosomes, endosomes, the plasma membrane and into the extracellular space or during the endocytic pathway, during which proteins and other macromolecules such as nutrients, fluids are internalized into the cell from the extracellular space. Read more..
What functions does the plasma membrane perform at the interface between the cell and its environment? Any communication or interactions between the intracellular and extracellular spaces occurs through the plasma membrane, which forms the boundary between these two regions. Read more..
What are the physiological functions of membranes? Eukaryotic cells and their organelles are enveloped by viscoelastic layers made of lipids and proteins. These layers are generally referred to as cell membranes and when they surround the entire cell, they are specifically known as the plasma membrane. Read more..
What is the plasma membrane? What is the CLIC/GEEC Endocytosis pathway? What is Rho-dependent IL-2 receptor endocytosis? What is Fast Endophilin-Mediated Endocytosis (FEME)?